One time my mom drew some paper dolls that looked just like my sisters and me. And they were awesome. I'm not willing to draw custom paper dolls for everyone though. Because that is just crazy talk. 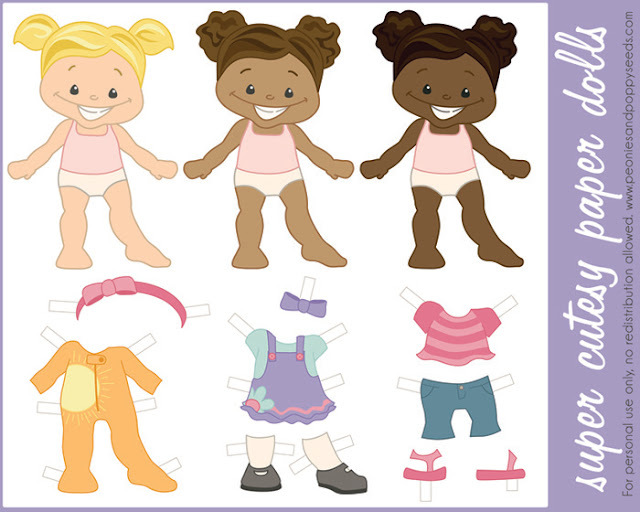 But you can get these free paper dolls to print and play with and make fun memories with your kids. Print these on cardstock and laminate them to last longer. Or you can cut off all the tags and mount the pieces on magnetic strips to get the clothes to stay on easier. The magnets also allow you to play with the dolls in fun places like the fridge. I plan on posting more clothing to print with these every once in awhile. But let me ask you a questions - do you want a boy version? Do boys like to play with paper dolls?